So the State of Florida recently decided that we won't get to keep any snook here on the Gulf coast until September of next year. This has a lot of local anglers upset and I have mixed feelings about the decision myself. On one hand I'm disappointed that I'll have to wait another year to grill one of these excellent game fish while our buddies on the east coast will have their season reopened this fall as scheduled. I think this sends a message to potential visitors that our snook population was damaged to a greater degree by the cold snap of 2010 than was actually the case. Those folks may actually choose to head to another part of the state to go fishing instead of coming here to Pine Island. That's something we don't need since our tourism is just staring to recover from last year's media-hyped oil spill and the still sluggish economy. On the other hand, one additional year of catch and release fishing will obviously have a positive effect on our snook population, which, as far as I'm concerned, is actually in great shape. From what I've been seeing and catching on my boat lately, there are a lot of really big snook swimming around in both Matlacha Pass and Pine Island right now. In fact, my anglers have landed more legal sized snook over the past six months than in the entire previous year. Since fly rods are the tackle of choice with most of my charters, hooking and landing big snook can be more of a challenge than most of our other species. Snook aren’t as omnivorous as redfish. You won’t find them digging crabs and shrimp out of the mud, so choosing the right pattern for them is a little trickier. Fortunately there are a lot of excellent flies out there that do a great job of imitating the pilchards and glass minnows that make up the majority of a snook’s diet. From the classic Lefty’s Deceivers to the modern Puglisi Baitfish patterns, there are plenty of effective choices. One of the best snook patterns of all time was born right here in Southwest Florida by Sanibel resident and fly shop owner Norm Zeigler. His creation is called Norm’s Crystal Schminnow and it’s one of the most simple and effective flies I’ve ever seen. Using only three different materials it can be tied in minutes, even by a beginner, and is just as effortless to cast on almost any size rod. Like most great fly patterns, Norm’s Crystal Schminnow is not an exact duplication of one type of prey. It’s more of a cross section of several species and its outline suggests both a shrimp and a minnow, which is how it got its name. The fly’s action underwater is also a combination of both with a nice little bouncing hint of injury when retrieved. A well placed Crystal Schminnow practically has “Kill Me!” written all over it to any hungry snook. Although it really excels as a beach pattern, an all white Schminnow is also my first choice when I’m hunting for snook around the mangrove shoreline. 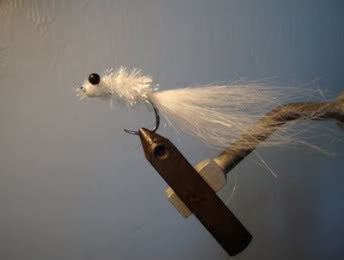 I was casting one of these flies into the mouth of a narrow creek near Matlacha recently when I saw a yellowish flash and felt a solid thump on the end of my leader. I buried the 1/0 Owner hook with a quick strip strike and watched as an unmistakably huge mouth burst through the surface. The big snook quickly tried powering back under the mangroves but the 20# leader was enough to keep it out in the open. Five minutes later I had the great 29 inch snook on the boat for some photos and a quick return to the water. Even though I’ve landed several larger snook on spinning gear this year, this fly caught fish beats them all. Sure, I’d like to be able to grill one later this fall but waiting another year will only make snook like this even more common. In the meantime, if you want to catch and release one on a fly, there’s no shortage of them out there right now.